This paper is based on a study that was done by utilising construction and demolition debris that had been effectively recycled, in structural members. The steel tubular columns were filled with different types of waste material, as well as recycled aggregate concrete, instead of normal conventional concrete. The results were subsequently analysed. The behaviour of circular and square concrete-filled steel tubular sections (CFSTs) under axial load, in which coarse aggregate had been partially replaced by recycled aggregates, is presented. The effects of steel tube dimensions, shapes and the confinement of concrete are also examined. Measured column strengths are compared with the values predicted by Eurocode 4, Australian Standards and American Codes. Twelve specimens were tested with 20 MPa concrete and steel sections with diameter-to-thickness ratios of 18,5, 25,3 and 36,0. The columns were of two different shapes - a circular-shaped set with diameters of 76 mm and 89 mm, and a square-shaped set with sizes 72 mm and 91 mm. The circular-shaped columns of 76 mm diameter and the square-shaped columns with 72 mm diameter are 900 mm long. The circular columns with a diameter of 89 mm and the square columns of 91 mm diameter are 350 mm long. Eurocode 4 (EC4) gives the best estimation for both conventional and recycled aggregate concrete. However, the American Concrete Institute (ACI) / Australian Standards (AS) equation predicted lower values than measured during the experiments. Hence the ACI/AS equation has been modified by introducing a multiplying factor 'k' to predict good results for columns of L/D < 12. The values of k factor for L/D ratio varying from 4 to 12 are suggested in this study. From the results it has been noted that square columns save 30% of steel when compared with circular columns. It was also observed that the ultimate load of steel tubular columns filled with recycled aggregate concrete is higher than that of conventional concrete and columns filled with recycled aggregate concrete, and can result in a 10% saving in the cost of concrete. This research therefore proposes a solution for effective solid waste management, which will also prove to be cost effective. Steel members have the advantages of high tensile strength and ductility, while concrete members have the advantages of high compressive strength and fire resistance. Composite members combine steel and concrete, resulting in a member that has the beneficial qualities of both materials. Two types of composite columns, those with steel sections encased in concrete and those with steel sections filled with concrete, are commonly used in buildings. Concrete-encased steel composite columns have become the preferred form for many seismic resistant structures. Under severe flexural overload concrete encasement cracks, resulting in reduction of stiffness, but the steel core provides shear capacity and ductile resistance to subsequent cycles of overload (Shanmugam & Lakshmi 2001). The steel column acts as permanent and integral formwork. The steel column provides external reinforcement. The steel column supports several levels of construction prior to concrete being pumped. Although CFST columns are suitable for tall buildings in seismic regions, their use has been limited due to a lack of information about the true strength and the in-elastic behaviour of CFST composite action. Because of the traditional difference between structural steel and reinforced concrete design, the procedure for designing CFST columns using the American Concrete Institute's (ACI) code is quite different from the load and resistance factor design (LRFD) method suggested by the American Institute of Steel Construction (AISC). The main objective of this study was to examine the effect of different types of infill used in CFST columns. An additional objective was to investigate the changes in behaviour if recycled aggregate is used for making the concrete. Twelve different specimens were tested for columns with pinned end conditions and the results are analysed in detail in this paper. Circular tubular columns have a definite advantage over tubular columns with other cross sections when used in predominantly compression members. For a given crosssectional area the former have a large uniform flexural stiffness in all directions. Filling the tube with concrete will increase the ultimate strength of the member. The main effect of concrete is that it increases the local buckling resistance of the tube wall and, in the restrained state, is able to sustain higher stresses and strains than when it is unrestrained. The use of CFSTs can potentially provide large cost savings by increasing the floor area through a reduction in the required crosssection size. This is very important in the design of tall buildings in cities where space is extremely expensive, and is particularly significant in the lower storeys of tall buildings where short columns usually exist. CFST can provide an excellent monotonic and seismic resistance in two orthogonal directions. Using multiple bays of composite CFST framing in each primary direction of a low- to mediumrise building provides seismic redundancy while taking full advantages of the two-way framing capabilities of CFSTs (Hajjar 2002). Experimental research on CFST columns has been going on worldwide for many decades, with significant contributions having been made particularly by researchers in Australia, Europe and Asia. The vast majority of these are experimental and have been done on moderate-scale specimens (less than 200 mm in diameter) using normal and highstrength concrete. Neogi et al (1969) investigated numerically the elasto-plastic behaviour of pin-ended CFST columns loaded either concentrically or eccentrically about one axis. It was assumed that complete interaction between steel and concrete, and the triaxial and biaxial effects present on the composite materials were not being considered. Eighteen eccentrically loaded columns were tested, in order to compare the experimental results with the numerical solutions. The conclusions were that there was a good agreement between the experimental and theoretical behaviour of columns with L/D ratios greater than 15, inferring that triaxial effects were small for such columns. A series of tests had been carried out (O'Shea & Bridge 1996) on the behaviour of circular thin-walled steel tubes. The tubes had diameter-to-thickness ratios (D/t) ranging between 55 and 200. The tests included bare steel tubes, tubes with un-bonded concrete with only the steel section loaded, tubes with concrete infill with the steel and concrete loaded simultaneously, and tubes with the concrete infill loaded alone. The test strengths were compared to strength models in design standards and specification. The results from the tests showed that the concrete infill for the thin-walled circular steel tubes has little effect on the local buckling strength of the steel tubes. However, O'Shea & Bridge (1997) found that concrete infill can improve the local buckling strength for rectangular and square sections. They also found that increased strength due to confinement of high-strength concrete can be obtained if only the concrete is loaded and the steel is not bonded to the concrete. For steel tubes with a D/t ratio greater than 55 and filled with 110-120 MPa high-strength concrete, the steel tubes provide insignificant confinement to the concrete when both the steel and concrete are loaded simultaneously. Therefore, they considered that the strength of these sections could be estimated using Eurocode 4 with confinement ignored. The influence of local buckling on behaviour of short circular thin-walled CFSTs has been examined (O'Shea & Bridge 1997). 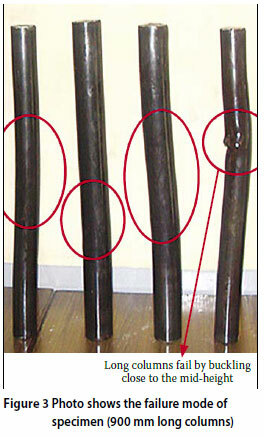 Two possible failure modes of the steel tube had been identified - local buckling and yield failure - and these were found to be independent of the diameter-to-wall-thickness ratio. It was, however, found that the bond between the steel and concrete infill determined the failure mode. A design method has been suggested based upon the recommendations in Eurocode 4 (1994). Kilpatrick & Rangan (1997) and Kilpatrick & Taylor (1997) examined the applicability of the Eurocode 4 for design of CFSTs which used high-strength concrete, and compared 146 columns from six different investigations with Eurocode 4. The concrete strength of columns ranged from 23 to 103 MPa. The mean ratio of measured to predicted column strength was 1,10 with a standard deviation of 0,13. 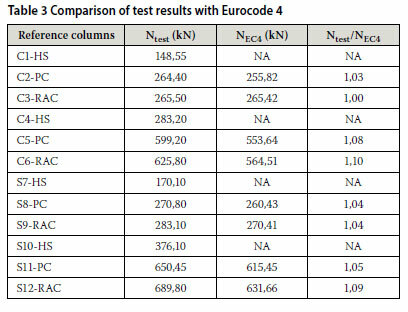 The Eurocode 4 safely predicted the failure load in 73% of the columns analysed. Brauns (1998) stated that the effect of confinement exists at high stress level when structural steel acts in tension and concrete in compression, and that the ultimate limit state material strength was not attained for all parts simultaneously. In his study, the basis of constitutive relationships for material components, the stress state in composite columns, was determined taking into account the dependence of the modulus of elasticity and Poisson's ratio on the stress level in concrete. O'Shea & Bridge (2000) tried to estimate the strength of CFSTs under different loading conditions with small eccentricities. All the specimens were short, with a length-to-diameter ratio of 3,5 and with a diameter-to-thickness ratio between 60 and 220. The internal concrete had a compressive strength of 50, 80 and 120 MPa. From those experiments O'Shea & Bridge (2000) concluded that the degree of confinement offered by a thin-walled circular steel tube to the internal concrete is dependent upon the loading condition. The greatest concrete confinement occurs for axially loaded thin-walled steel with only the concrete loaded and the steel tube used as pure circumferential restraints. Eurocode 4 has been shown to provide the best method for estimating the strength of circular CFSTs with the concrete and steel loaded simultaneously. Mandal et al (2002) reported that the quality of recycled aggregate concrete improves considerably with the addition of fly ash. This, in turn, improves the durability of recycled aggregate concrete against sulphate and acid attack. Therefore, the results of this study provide a strong case for supporting the use of recycled aggregates instead of natural aggregates for the production of concrete. Ramamurthy & Gumaste (1998) reported that the compressive strength of recycled aggregate concrete is relatively lower and varied depending on the strength of the original concrete from which the aggregates had been obtained. This reduction is mainly caused by the bond characteristics of recycled aggregate and the fresh mortar of the recycled concrete. Twelve specimens of circular (designated C) and square (designated S) sections were tested for the purposes of this study. The column specimens were classified into three different groups. Each group consisted of four specimens filled with plain concrete (designated PC), partial replacement of coarse aggregates by recycled aggregate concrete (designated RAC), and the rest of the column specimens were tested as hollow sections for comparison (designated HS). The properties of all specimens are given in Table 1. All the specimens were fabricated from circular and square hollow steel tube and filled with two types of concrete, namely plain and recycled aggregate concrete. The average values of yield strength and ultimate tensile strength fy for the steel tube were 260 and 320 MPa respectively. The modulus of elasticity Es was found to be 2,0 x 105 MPa. In the present experimental work, the parameters of the test specimens were the shape of specimen, size of specimen, strength of concrete and D/t ratio of columns. All the selected parameters were within the ranges of practical limits. In order to prevent the steel hollow column section from local buckling, ACI (1995) requires the width-to-thickness (B/t) ratio of the steel hollow section to be not greater than the limit (√(3Es/fy) . In the steel hollow column section tested, L/D = 12,5 with B/t = 36,0, and for L/D = 11,8 the B/t is 25,3. In both the cases B/t was found to be less than the prescribed limit (√(3Es/fy) = 48,04). The concrete mix was obtained using the following dosages: 383 kg/m3 of Portland cement, 533 kg/m3 of sand, 1 185 kg/m3 of coarse aggregate with maximum size 12 mm and 192 litres of water. Construction and demolition debris was taken on the basis of weight. In order to characterise the mechanical behaviour of concrete, three cubes, three prisms and three cylindrical specimens were prepared from each concrete and tested to determine the compressive strength, flexural strength and splitting strength respectively. The mean values of the strength, obtained from these tests on concrete at an age of 28 days, are summarised in Table 2. During preparation of the test specimens, concrete was cast in layers and lightly tamped using a wooden hammer for better compaction. The specimens were cured for 28 days in a humidity-controlled room. All the tests were carried out in an electronic universal testing machine (UTM) of capacity 1 000 kN. The columns were hinged at both ends and axial compressive load was applied. 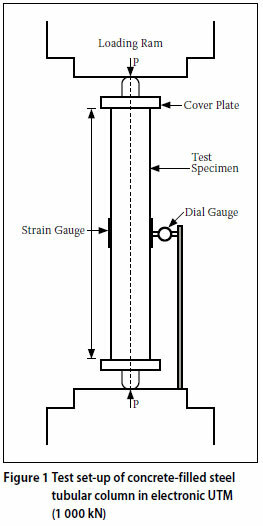 The test set-up of columns is shown in Figure 1. A pre-load of about 5 kN was applied to hold the specimen upright. Dial gauges were used to measure the lateral and longitudinal deformations of the columns. The load was applied in small increments of 20 kN. At each load increment, the deformations were recorded. All specimens were loaded up to failure. 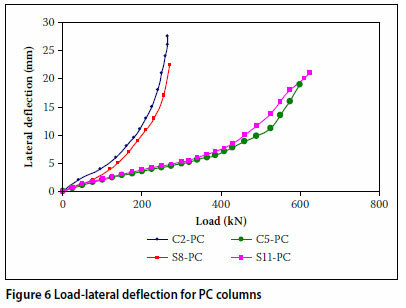 Figure 2 shows that the failure mode of 350 mm long columns is by local buckling close to the supports, as indicated by circles in each column. 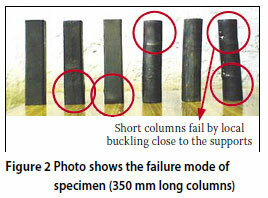 Figure 3 shows the failure in the case of 900 mm length columns, with considerable lateral deflection and overall buckling nearer to the mid-height of the columns, as indicated in each column. 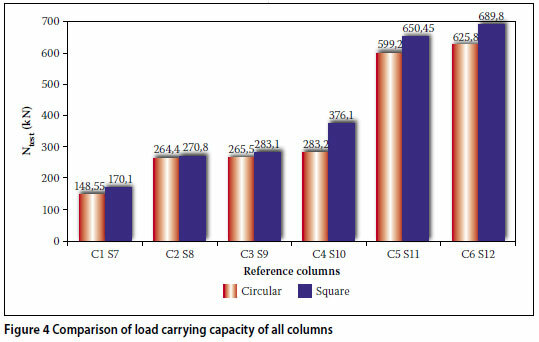 Figure 4 shows the load carrying capacity of square and circular column sections. From Figure 4 it can be noted that the load carrying capacity of square columns of all sizes, hollow as well as filled with plain concrete and recycled aggregate concrete, is more than that of the circular column with a comparable size. 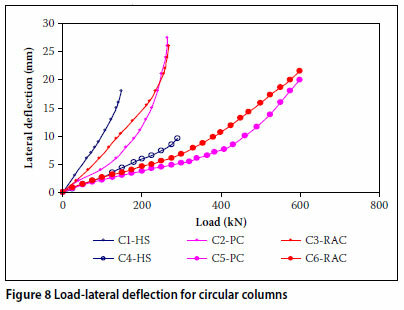 Figure 5 shows the loadlateral deflection patterns for both hollow circular (76 mm and 89 mm) and square (72 mm and 91 mm) columns. From Figure 5 it can be observed that the hollow square column performs better than the hollow circular column. Also from Table 1, it can be observed that the strength to weight ratio of a 72 mm hollow square column is about 41% more than that of a 76 mm hollow circular column, and for a 91 mm hollow square column it is about 34% more than for an 89 mm hollow circular column. Hence about 30% of steel can be saved when square columns are used to obtain the same load capacity. Figure 6 shows the load-lateral deflection pattern of circular and square columns filled with plain concrete. 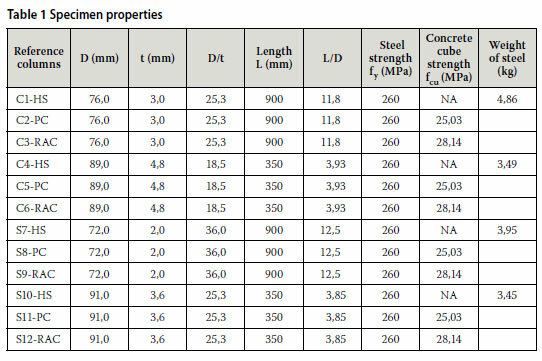 From Figure 6 it can be noted that tubular columns filled with plain concrete of characteristic strength fck = 20 MPa grade (the minimum charac c teristics compressive strength of concrete cubes, i.e 20 MPa as per Indian Standards IS 456-2000) resist more load than hollow columns. Comparing Figures 5 and 6, it can be observed that the strength of hollow columns increases by about 60-112% when filling them with conventional concrete. When comparing square and circular columns, square columns resist about 3-9% more load than circular columns for similar areas. Figure 7 shows the load-lateral deflection pattern of circular and square columns filled with recycled aggregate concrete. 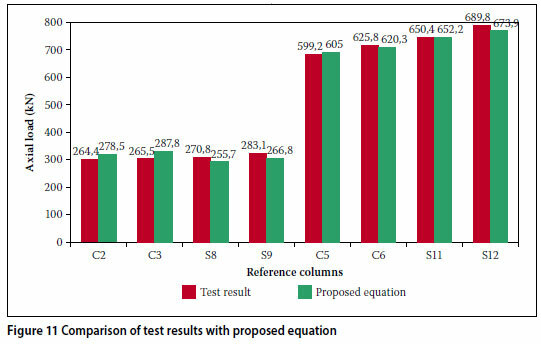 From Figure 7 it is noted that tubular columns filled with recycled aggregate concrete resist 5-10% more load than those filled with normal concrete. When compared to hollow columns, recycled aggregate concrete-filled columns take 66-121% more load. When compared to circular recycled aggregate concrete-filled columns, square recycled aggregate concrete-filled columns resist 6-10% more load. Hence, if recycled aggregate concrete-filled square columns are adopted, a saving of about 30% in the cost of steel and a saving of up to 10% in the cost of concrete can be achieved. 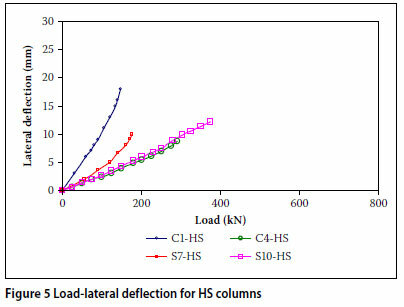 Figures 8 and 9 compare the load-lateral deflection patterns for circular and square columns of hollow sections, filled with normal concrete and filled with recycled aggregate concrete. The use of recycled aggregate as a filling material in concrete increases the load-carrying capacity to a greater extent compared with that of plain concrete-filled columns, and reduces the lateral displacements. This may be due to the fact that the strength of CFST columns depends on the filled concrete strength. The filled recycled aggregate concrete has more compressive strength, as determined during testing of concrete cubes. The experimental ultimate axial loads are compared with the predicted load from EC4 as shown in Table 3. All the predicted values from EC4 are lower than that of values obtained from the test results. The best estimation of EC4 is achieved for columns filled with conventional and recycled aggregate concrete of 900 mm length. When comparing the predicted values and test results for recycled aggregate concrete-filled columns, it is found that the variation is only marginal. The maximum Ntest/NEc4 for the 900 mm test c length column is 1,04 and for the 350 mm length column it is 1,10. Based on Table 3, it is clear that EC4 can reliably predict the axial capacity of CFST columns filled with conventional and recycled aggregate concrete. 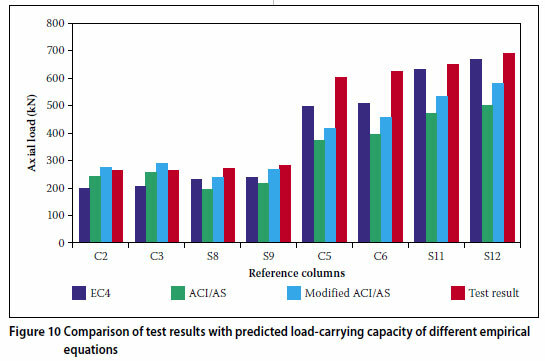 Detailed comparisons of load carrying capacity of composite columns with ACI and AS are presented in Table 4. For square columns the experimental results are 20% and 45% more than that of predicted values by ACI/AS codes for 900 mm and 350 mm long columns respectively. The variation of strength between the values from tests and that from the codes are constant for both plain and recycled aggregate concrete. From Table 4, the Ntest/NACI/AS ratio shows a value larger than unity for the 350 mm length column. In the case of 900 mm length concrete-filled circular and square columns differences of 5-8% and 20% are observed respectively in the above ratio. For 350 mm length columns, the differences are much greater. The variation is about 45% for both conventional and recycled aggregate concrete. The ACI and AS appeared to be very conservative, due to the fact that concrete confinement was ignored in the estimation of their axial load capacity. This observation was also made by Giakoumelis & Lam (2004), hence they proposed a modified equation as NACI/AS = 1,3 Ac fcy+Asfy. Table 5 shows the comparison of test results with the modified ACI/ AS formula. All the experimental results for CFST columns are approximately 9% less than those from the modified equation for 900 mm length circular columns, and 30% higher than that of the modified equation for 350 mm length columns. The variation between the values from the tests and that from the modified equation are approximately constant for both conventional and recycled aggregate concrete. 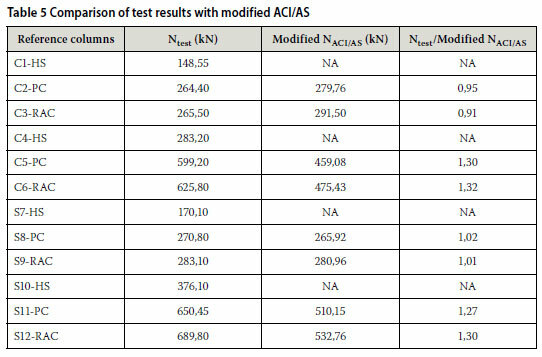 Figure 10 shows the comparison of test results with EC4, ACI/AS codes and Modified ACI/AS equation. From Figure 10 it can be seen that the test results are higher than the predicted values by the different empirical equations. 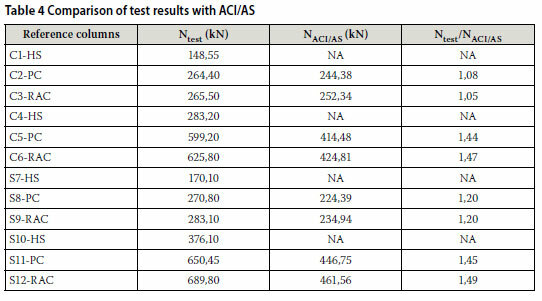 From Table 5 it can be seen that modified ACI/AS correlates well with experimental results (L/D=12,5), and hence NACI/AS = 1,3 Ac fcy + As fy is applicable for steel tubular sections filled with concrete. It is also obvious that the above equation under-estimates the strength of columns by about 27-32%, and that, when the L/D ratio reduces, the predicted strength also reduces. In EC4 code, the difference between predicted and actual strength is 3-10% only, because the confinement effect has been considered. However, in ACI/AS the difference is up to 49%, because there is no consideration for the effect of confinement or L/D ratio. Hence, this equation needs to be modified to predict the exact strength. A detailed analysis of the experimental results was carried out in this study. The capacity of the composite columns depends on the basic compressive strength of filled concrete and the confinement effect. To account for the enhancement in strength due to the above facts a multiplication factor k is suggested for different L/D ratios and the values of k are presented in Table 6. A single multiplication factor is suggested so that it can be easily adopted. The capacity of the columns predicted by the above equation is compared with the existing experimental results. Figure 11 shows this comparison and it can be seen that the prediction by the proposed NACI/AS is in good agreement with the test results. In order to verify the results of the equation, a set of three column tests was carried out. These specimens used in the verification tests had three other values of L/D ratios. A comparison of these results with the capacities predicted by Equation 3 is shown in Table 7. It can be seen that the values, although exceeding by 6% in two cases, can still be considered a good approximation, and hence the proposed equation can be used in its simple form to estimate the capacity of the CFST columns. Concrete-filled steel tubular columns can resist 60-112% more load than hollow steel tubular columns for sections with the same size and steel area. Recycled aggregate concrete-filled columns resist 66-121% more load than hollow columns, and 6-10% more than columns filled with plain concrete. Square columns resist 34-41% more load than circular columns for the same area of steel. Hence, size reduction for square columns is possible. In the case of square columns, a cost saving in the region of 30% can be achieved when compared to circular columns of the same cross-sectional area. Among the codes of practice for composite columns, EC4 provides a good prediction of the axial strength of CFST columns, with a maximum of 10% difference in the value on the axial capacity for the range of parameters tested. 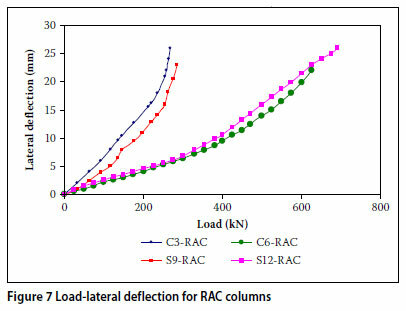 Good prediction of load capacity is achieved with NEC4 as Ntest/NEC4 ratio for specimens is around unity. In some cases the predicted axial strengths using ACI/AS are 45% lower than the results obtained from experiments. The modified ACI/AS equation suggested by Giakoumelis & Lam (2004) gives better results for specimens S8-PC and S9-RAC only for cases when L/D = 12,5. The enhancement of strength in the case of CFST columns depends on the compressive strength of filled concrete and on the confinement effect. The proposed NACI/AS Equation 3 with the single multiplication factor 'k' predicts the capacity of the columns tested and is easy to use. It has, however, been shown that an over-prediction of approximately 6% can be obtained. The equation is valid when 4 < L/D > 12. Considering that recycled aggregate concrete has a higher compressive strength, it was found that, when recycled aggregate concrete is used instead of plain concrete, a cost saving in concrete can be achieved. Recycled aggregate, used in concretefilled square columns, results in cost savings when compared to circular columns filled with plain concrete. Usage of recycled aggregate concrete in steel tubular columns is not only a waste utilisation technique, but also saves cost and, if designed properly, can result in size reduction of columns, thereby increasing the working space. The authors thank the Department of Science and Technology, New Delhi, and the All India Council for Technical Education, New Delhi, for the financial support provided to conduct this research. They also thank the Principal and the Management of the Kongu Engineering College for extending facilities to enable the research work. DR E K MOHANRAJ is Professor in the Department of Civil Engineering, Erode Builder Educational Trust's Group of Institutions (EBET), Kangayam, India. He has more than twelve years of teaching and industrial experience. His areas of interest a re steel-concrete composite structures, utilisation of waste materials in concrete, and earthquake resistant structures. He is a recipient of the Career Award for Young Teachers for the year 2007 from the All India Council for Technical Education (AICTE), New Delhi, and of the Best Teacher Award for the year 2008 from KEC International Limited. He is a principal investigator for four R&D projects supported by the Department of Science and Technology (DST), India, AICTE and the Institution of Engineers, India. He has published about 65 papers in reputed national and international journals and conferences, and has visited various universities in Thailand, China, Singapore and Malaysia to present papers. DR S KANDASAMY is Dean atthe Anna University Tiruchirappalli, Ariyalur Campus, Ariyalur, India. He has more than 26 years of teaching experience and 15 years in R&D. His areas of interest are cold-formed steel structures, high-performance concrete, utilisation of waste materials in concrete, and earthquake resistant structures. He has published 15 papers in international and national journals, and has presented nine and 25 papers respectively at international and national conferences. He is a Life Member of the Institution of Engineers, India, and of the Indian Society for Technical Education (ISTE), New Delhi. DRR MALATHY is Principal atthe Excel Engineering College, Komarapalayam. She has more than twenty years of teaching experience and six years of R&D experience. She is a principal investigator for four R&D projects supported by the All India Council for Technical Education (AICTE ), the Institution of Engineers, India, and the Department of Science and Technology (DST), India. She published about 50 papers in reputed journals and conferences at international and national levels. She received the Best Teacher Award for the year 2004 from KEC International Limited, and the Innovative Teacher Award for the year 2005 from the Chiefs Committee on Human Resources Development (CLHRD), Mangalore. In 2006 she received the Career Award for Young Teachers from the All India Council for Technical Education (AICTE), New Delhi. She visited Singapore, South Korea and the United Kingdom to present papers at international conferences.